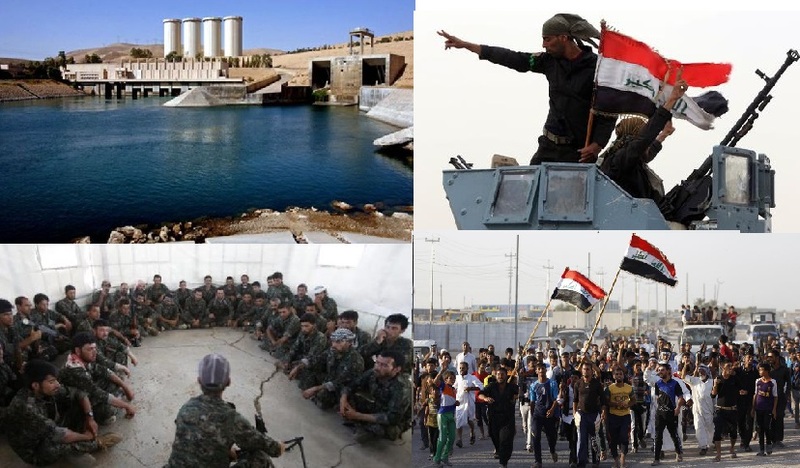 JNN 23 Aug 2014 Baghdad : Kurdish peshmerga fighters and Iraqi counter-terrorism forces have pushed terrorists of the so-called ‘Islamic State of Iraq and the Levant’ (ISIL) out of Mosul dam, state television reported on Monday. The television station quoted Lieutenant-General Qasim Atta, a military spokesman, as saying the forces were backed by a joint air patrol. He did not give details. An independent verification was not immediately possible. ISIL militants have seized several towns and oilfields as well as Mosul Dam in recent weeks, possibly giving them the ability to flood cities or cut off water and electricity supplies. Asked about a Kurdish push to dislodge the militants on Sunday, a Kurdish official said they had not retaken the dam itself but had seized “most of the surrounding area”. ISIL militants have told residents in the area to leave, according to an engineer who works at the site. The engineer said the militants told him they were planting roadside bombs along roads leading in and out of the facility, possibly in fear of an attack by Kurdish fighters who have been bolstered by U.S. airstrikes. U.S. planes – deployed over Iraq because of the ISIL’s advances for the first time since the U.S. troop withdrawal in 2011 – had been striking targets near Mosul Dam over the last 24 hours, peshmerga spokesman Halgurd Hikmat said. The White House said on Sunday that President Barack Obama had informed Congress he authorized U.S. air strikes in Iraq to help retake control of the Mosul Dam, which it said was consistent with his goal of protecting U.S. citizens in the country. U.S. officials said last week the U.S. government was directly supplying weapons to Kurdish peshmerga fighters. Witnesses said Kurdish forces have recaptured the mainly Christian towns of Batmaiya and Telasqaf, 30 km (18 miles) from Mosul, the closest they have come to the city since ISIL terrorists drove government forces out in June. The insurgents have also tightened their security checkpoints in Mosul, conducting more intensive inspections of vehicles and identification cards, witnesses said. The European Union has allowed individual EU governments to supply arms and ammunition to Iraqi Kurds, provided they have the consent of authorities in Baghdad. Washington is already supplying weapons. Buoyed by an operation to recapture a strategic dam from the rebels after two months of setbacks, Iraqi army units backed by Shia militias fought their way towards the center of Tikrit, a city 130 km north of Baghdad, AFP reported. “Our forces are advancing from two directions with a cover from army helicopters, mortar and artillery shelling the positions of fighters in and around the city,” an army major in the operations room told Reuters. The Iraqi major said fierce fighting was underway near Tikrit’s main hospital 4 km from the city center of the city. “Helicopters are pounding the bases of the terrorists to prevent them from regrouping,” he said. As well as a push from the south, Iraqi forces were advancing only slowly from the west due to land mines and roadside bombs planted by the militants, he added. A police captain confirmed the details of the fighting. ISIL has concentrated on taking territory for its self-proclaimed caliphate in Syria and Iraq unlike al-Qaeda – the movement from which it split – that has repeatedly attacked U.S. targets including New York and Washington on September 11, 2001. However, in a video posted on the Internet warned Americans in English that “we will drown all of you in blood” if U.S. airstrikes hit its fighters. The video also showed a photograph of an American who was beheaded during the U.S. occupation of Iraq that followed Saddam’s overthrow in 2003 and victims of snipers. Efforts are underway in Baghdad to form a new government that will unite the majority Shias with the Sunnis and Kurds in halting the ISIL that threatened to tear the country apart. The UN refugee agency said Tuesday it was poised to mount a massive aid operation for 500,000 Iraqis driven from their homes by rebels, according to AFP. “In response to the deteriorating situation in northern Iraq, UNHCR is this week launching one of its largest aid pushes aimed at helping close to half a million people who have been forced to leave their homes,” spokesman Adrian Edwards told reporters. The terrorists, who have declared a “caliphate” in a region straddling the Iraq-Syria border, have after two months of violence brought Iraq to the brink of breakup. To date, the United Nations estimates that 1.2 million Iraqis have been displaced by fighting this year, Edwards said ahead of the extraordinary aid push set to begin Wednesday. “Barring last-minute delays, an air, road and sea operation will begin tomorrow, starting with a four-day airlift using Boeing 747s from Aqaba in Jordan to Irbil, followed by road convoys from Turkey and Jordan, and sea and land shipments from Dubai via Iran over the next 10 days,” he said. Among the initial supplies are 3,000 tents, 200,000 plastic sheets, 18,500 kitchen sets and 16,500 jerry cans. Edwards said that a key goal was to help those who lack shelter or housing. Hundreds of Iraq’s displaced Izadi Kurds have joined military training camps in Syria to prepare for battling Takfiri ISIL terrorists in Iraq, sources say. Kurdish militants have also trained hundreds of Izadi volunteers at several camps inside Syria to fight ISIL forces in Iraq, a member of the armed Kurdish YPG and a Reuters photographer who visited a training camp said on Sunday. The photographer spend Saturday at one training camp in northeastern Syria where he saw 55 Izadis being trained to fight. One of the training camps is located in Qamishli, northeastern Syria on the border with Iraq’s semi-autonomous Kurdistan region, where Izadi Kurds are being trained by the Syrian Kurds, a photographer working for Reuters said on Sunday. The volunteers “really want to go back to Iraq to fight,” the unnamed photographer added. Iraq has faced a brutal offensive by the ISIL across the country’s north and west since early June. However, the crisis has deteriorated in recent weeks, as the militants swept over new towns in the north, forcing members of the minority Christian and Izadi communities out of their homes. Tens of thousands of Izadi Kurds escaped to take refuge in the Sinjar Mountain range, becoming trapped for days without food or water. Some have been airlifted out by Iraq’s Air Force and others escaped to Syria. Meanwhile, a member from the media office of the Kurdish YPG, or the People’s Defense Units, told Reuters that the Izadi volunteers in Syria train in weapon use and fighting tactics for several days before being sent back to Mount Sinjar to fight. “In the past ten days, hundreds [of Izadi Kurds] have graduated. And we are training more,” said Anas Hani from eastern Syria, noting that the volunteers “have established what they call the Singar Resistance Units” on the top of the Singar Mountains, in cooperation with locals and the YPG. The ISIL terrorists have been committing heinous crimes in the captured areas, including the mass execution of civilians and Iraqi security forces. On Friday, the Takfiri militants massacred around 100 members of the Izadi Kurds minority in the village of Kocho, northern Iraq. The uprising against extremists in Anbar province, where Terrorists from the Islamic State of Iraq and the Levant (ISIL) group and insurgent allies hold major areas, came a day after Nouri al-Maliki, the Iraqi premier, abandoned his bid for a third term. The current effort could potentially be a major turning point in Iraq’s two-month conflict against an ISIL-led offensive. “This popular revolution was agreed on with all the tribes that want to fight ISIL, which spilled our blood,” Sheikh Abdel-Jabbar Abu Risha, one of the leaders of the uprising, told AFP. ISIL-led Terrorists launched a major offensive in June that swept security forces aside and overran large areas of five provinces, including Anbar, where parts of provincial capital Ramadi and all of the city of Fallujah had already been outside government control since January. Anbar police chief Maj. Gen. Ahmed Saddak said security forces were backing the uprising, which began at 6:00 am Friday. The push by tribesmen and security forces began with attacks on multiple areas northwest of Anbar provincial capital Ramadi, Abu Risha and Saddak said. Police Col. Ahmed Shufir, meanwhile, said that Kataeb Hamza, a group that fought against Al-Qaeda-linked Terrorists in past years, has been reformed and is based out of the town of Haditha in Anbar province. Its forces aim to fight against militants who hold areas west of the town, he said. Abu Risha said that the effort had been in the works for weeks and was not linked to Maliki’s announcement Thursday night that he would step aside. Shia volunteer fighters have already started forming battalions to protect Iraqi towns against ISIL radicals who are reported to be largely funded by foreign countries. ISIL overran Iraq’s second largest city, Mosul, in June. They had taken the central city of Fallujah and parts of nearby Ramadi in December 2013. This entry was posted in Iraq News, Middle East and tagged Aryans Race, Home Town, Iraq, Iraqi Shia, Iraqi Sunni Tribes, Islamic State of Iraq, Izadi Kurds, Mosul, Mosul Dam, Saddam Hussain, Syria, Tikrit. Bookmark the permalink. Reblogged this on LissaBreen – Welcome To My World (My Life, My Way&My Destiny). ALLAH KAY GHAR DER BUT NO ANDHER . ZIONIST WAHABISHT WILL SOON BE DOWN THE DRAIN .